Cruising by Northgate Mall on I-5, the nearly completed Thornton Place evokes images of sci-fi outposts rising from the barren landscapes of distant planets. In reality, Thornton Place is, in fact, a daring pioneer in a built environment that is likewise hostile to human life. 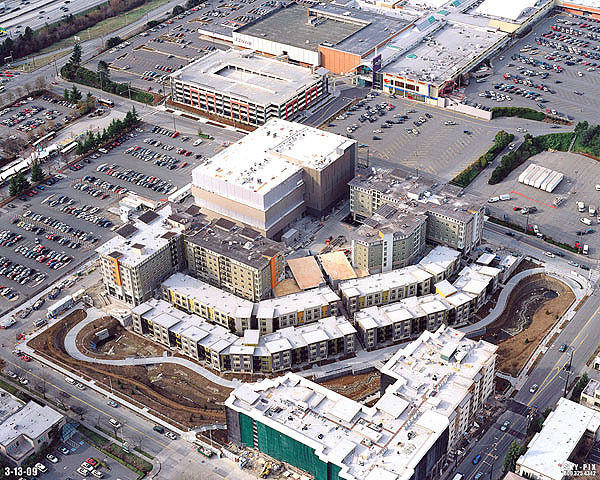 And the conversion of nine acres of asphalt into the development shown in the photo above is phenomenal accomplishment: Thornton Place is Seattle’s first real transit-oriented development (TOD). Aye, it’s a big one: 109 condos, 278 apartments (20 percent affordable), a 14-screen cinema, 50,000 sf of retail, and a 143-units of senior housing, along with a new daylit section of Thornton Creek. The block is roughly 600 feet square — about twice the length of typical Seattle block. Ideally, it would have been better to break up the block with bisecting streets, though some folks who object to the size of the project would seem to be under the impression that everything you need to know about urban development can be picked up from a few chapters of Jane Jacobs. Small-scale, incremental development is wonderful. But in some cases, big projects make sense, and Thornton Place is one of those cases. Northgate has been targeted for growth by city planners for decades: It is a designated Urban Center, a bus transit hub and future light rail station area. But the existing car-oriented, single-use built environment around the mall is a highly unappealing site for small-scale mixed-used residential development — what developer would risk being the lonely pioneer amidst a sea of big box and parking lots? In contrast, a large project like Thornton Place creates a center of gravity powerful enough both to keep itself alive, and to be a catalyst for future adjacent development. And no, Thornton Place will never be the ideal walkable community, but it gets about as close to that ideal as you could realistically expect, given its context. As mentioned above, reconnecting the existing street grid through the project would have been a good urban design move, but then who would pay for those streets? They ain’t cheap. For the Burien Town Square project — a similar pioneering outpost — the stars aligned to bring in $7 million in grants to pay for interior streets. In any case, Northgate neighbors objected to through-streets over fears of increased traffic. And a north-south through-street would have interrupted the creek bed. All and all, given the circumstances, the Thornton Place plan does an admirable job of breaking down the block and creating a permeable site, with a dogleg street in the northwest corner, and numerous pedestrian walkways, most of which are permanent public easements. The project includes 880 subterranean parking stalls, which sounds like a lot for a site next to a transit hub. But through no small amount of cajoling, the developer was able to convince the City and County to allow about 350 of those stalls to be shared as Metro Park&Ride stalls. This enabled a reduction of the total stall count to about 200 below what city code normally requires. At $40k a stall, that’s $8 million not spent on parking. You’d think shared parking arrangements like this would be a no-brainer, but they are still almost unheard of in Washington State. 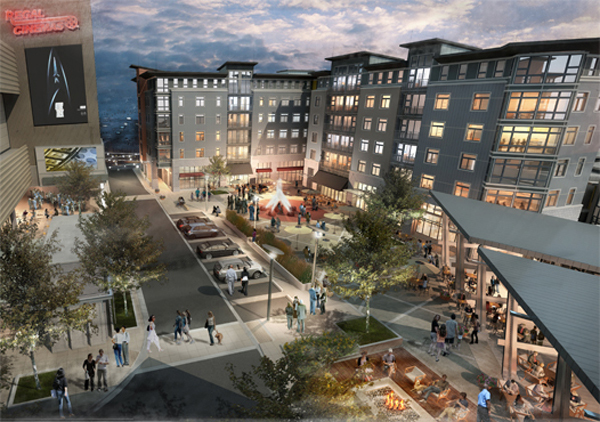 The intended social heart of the development is an internal plaza in the northwest quadrant (see rendering above). It’s a space that turns its back on the outside world, but was there really any choice when the outside world is currently a wasteland of giant mall parking lots? Given the density of residences and the draw of the movie theaters, this plaza has great potential to become a vibrant people place. Obviously, the massive box of a cinema is the clunker of the project, and not only physically. Mega-retail that must by necessity draw from a wide geographical area is antithetical to pedestrian-oriented communities. Even though someday lots of people may ride the train to the movies, it still means other neighborhoods are likely to be deprived of a local theater. The 2.5-acre landscaped area around the daylit creek provides an open space with a character opposite to that of the plaza: It’s green, relatively quiet, and extends to the outside borders of the project. When the landscape grows in and development starts to fill in across the streets, this open space will be a cherished amenity. And while the ecological contribution of the daylit creek to salmon habitat may be relatively minor, the symbolic value is immense. Subtracting off the 2.5 acre open space and another one acre for the cinema, the net density for the project comes out to 96 dwelling units per acre. Remember how HB1490 proposed allowing at least 50 units/acre in high-capacity transit station areas? Here’s an example that about doubles that density with a combination of three and six story buildings — no high-rise necessary. All said, what makes Thornton Place so noteworthy is also the biggest challenge to its success: the location. Market rate rents are expected to be just under $2/sf, while condos start at $300k for 600 sf. This pricing is competitive with similar housing in established neighborhoods like Ballard. Which would you choose? But it would behoove us to figure out how to make developments like Thornton Place work. Large-scale mixed-use infill projects are likely to be the essential catalytic medicine for bringing transformational change to countless urban and suburban malls across the country. Posted by dan bertolet on	Tuesday, April 14th, 2009 at 9:03 am. You can follow any responses to this entry through the RSS 2.0 feed. You can leave a response, or trackback from your own site. I think this is a great project that took some big risks. I hope it works. My brother is already looking for a way to move in here. I live downtown and it sounds tempting to me too. I’ll be interested to see this place in person. Stellar Holdings actually looks like a real-estate developer, certainly the kind we need more of. They appear to understand the difference between community-oriented development and density for density’s sake (as this blog seems to advocate oh-so-often). Like I said, I’ll reserve judgement, but this is clearly the most promising example of Seattle TOD I’ve seen so far. Does anyone know how easy it’ll be to hop on light rail from surrounding neighbourhoods, or will one have to traverse that giant park and ride? For $330k, buy a 2 bedroom on 5th and walk over to the movies. I just can’t see spending $300k for only 600 sq feet. Too teeny. If it had been 750 sq feet, I’d spend $350 in a hearbeat. I don’t understand how that huge theater block made it past design review. It’s really out of scale for a community that hopes to be pedestrian friendly. EeePC, The hope is that Metro will develop the park and ride before light rail arrives in 2020. Thornton Place is a gorgeous addition to the Northgate neighborhood. Hopefully, it is the beginning of more projects like it at Northgate, especially if the proposed Northgate Way rezone and urban design framework are approved by Council. And, hopefully a better use of the Northgate Mall property is someday realized. That land could be much better used for housing and denser retail, especially with the enormous investment in light rail on the way. Will the theater have frequent entrances or will their be large stretches of blank wall? Thorton Creek is the first TOD for Link Light Rail, but every dense part of the city was once Streetcar TOD. This “TOD” is actually just condos surrounded by parking lots. A better name might be Parking Lot Place. Transit from the parking lot to your condo by walking past a movie theater cube. Sign me up. What about a grocery store? All those people and all that transit and no place close by to grab a head of lettuce and some hamburger. I am disapointed. Actually there is a QFL nearby. It’s about 1/6 miles north east from the Thornton Place (Roosevelt and Northgate Way). I wonder if one of those 50,000 sf rental spaces will be taken up by a grocery store? Never say never… I think Thornton Place and Northgate have a real chance as a walkable area. Two vital institutions exist on the ground today: Northgate Community Center and Northgate Branch of the Seattle Public Library, conveniently located 2 megablocks or less than half a mile away from Thornton Place (on your way to that QFC!). The issue is that distance is entirely mall parking along a busy arterial. Give it 10 years. Has anyone figured out how to build a parking garage that can be repurposed into an apartment building? Even if all those parking lots could be consolidated into a couple of cheap parking garages, the landscape and walking experience would be vastly improved… I hope sooner rather than later. I’m thrilled with the development — that ugly parking lot was so NASTY for waaaaaaay too long. I can hardly wait to go to the movies right here in my own neighborhood. I look forward to going to dinner and walking through the park in the evenings. But holy cow, the units are really expensive! I’d love to find some way that my mom could get a place down there and be able to transition to assisted living someday, and be close to me — but that kind of pricing puts it completely out of our range. good project…despite regressive nimby whiners on Slog. I thought Seattlites were supposed to be “progressive”. I tempted at Lorig last spring. They are the developer of this project. I think it’s great and am very supportive of it. I spent 6 years living in Washington, DC where the 32 year old Metro system has spurred incredible amounts of TOD around most of the stations. You can literally walk up Connecticut Ave. NW under which the Red Line runs and see how the development gets taller and denser as you near a Metro station, then lower and more sparse again as you hit a midpoint between stations. That’s what Seattle should look like. I’m wary of big boxes in urban areas, but not so reflexively opposed to them as many Seattleites. Why? Because I’ve spent time in DC and New York where I’ve seen that they don’t have to be awful, monstrous, impermeable, inhospitable structures that house evil chains like Wal-Mart. Look at the new Columbia Heights station area in DC. Many national chains (Bed, Bath and Beyond; Best Buy; Target) realized a few years ago that they’d saturated the suburban and rural areas with stores but neglected big cities. And they realized that hulking one-story boxes surrounded by parking don’t work in urban areas. So they’ve developed stores with smaller horizontal footprints that make use of height instead. They work fairly well as TOD components. Furthermore, I’ll give the example of myself living on Capitol Hill where my only choices for buying a lot of things are grossly overpriced stores like QFC. If I want reasonable prices or items I can’t get on the Hill, I have to go down to Costco (CAR!) or up to Northgate to Target, if not outside the City altogether. This reduces urbanites’ quality of life and sends tax revenue Seattle could be collecting to the suburbs. I want a Target downtown or on Capitol Hill! Finally, while others have covered many great aspects of this project, I also work in the area now; 4th Ave. NE & NE 100th St. This project, like Olive 8 and others in town, aims to be and markets itself as pedestrian-friendly, yet it’s closed a huge stretch of sidewalk to pedestrians for well over a year during construction. Sometimes this is unavoidable, but it can be reduced and mitigated much better. 5th Ave. NE is an important arterial–it’s how you get to and from the library and community center, and Northgate North. Yet there’s no provision for pedestrians to walk on the west side of the street. If that kind of practice is allowed and continued, one street may reopen upon completion of one project, but other sidewalks will close when nearby projects are built. This closes large and important part of the pedestrian transportation network, making the area not so ped-friendly, and it’s unsustainable. In 2008 City Council commissioned a report from the City Auditor’s office on construction sidewalk closures, and the result is excellent. A stakeholder committee is now going over the report to make recommendations to the Council, and we’re going to need to be squeaky wheels telling Council to adopt the recommendations for a new regime that will reduce the number, size, and duration of sidewalk closures and provide alternative continuous pedestrian paths around construction sites. Why not s Target at Othello? If it’s a link ride away, why on earth would people want it downtown or at Dearborn? Fred Meyer does better. There was a great Fred Meyer in Braodway Market before QFC took it over. BTW I lived right on the street that has that mall in NW DC almost 30 years ago. That is not ‘downtown’ any way you look at it. I’ve also seen the ups and downs of TOD at Rhode Island and Rockville, and I compare Northgate to Rockville. Could be interesting how it ends up. Why not both? QFC is not going to fold and bring Fred Meyer back to Capitol Hill. I never said Columbia Heights was downtown. I lived there too, in 2000 and 2001 right on Park Rd. NW at 14th St. It is most certainly urban and inner city, and a good example of where national chains opened stores using their more vertical, urban floor plans like those in Manhattan. That Target is the first and only one in the District of Columbia; no more do DC residents have to go to Route 1 and pay sales tax to VA. There is no TOD at the RI Ave. station–that’s one of the notorious failures good groups like the Coalition for Smarter Growth are working on now. Rockville works pretty well, but that’s much further from downtown than Northgate is; roughly 15 miles, the 2nd last stop on the Red Line. Northgate is about 7-8 miles from downtown; more like Bethesda. Any updates on grocery store at thornton place. I would love to see one there! Hello – quite good web site you might have created. I enjoyed reading through the posting. I did wish to issue a comment to tell you that the layout of this internet site is very aesthetically delightful. I utilized to be a graphic designer, today I am a copy editor in chief for a advertising firm. I have always enjoyed playing with info processing systems and ‘m trying to learn computer code throughout my free time (which there is never sufficient of lol).